The BAe / McDonnell Douglas Harrier II is a single-engine single-seat Vertical/Short Takeoff and Landing (V/STOL) fighter bomber aircraft produced by the US-American manufacturer McDonnell Douglas, today Boeing and the British manufacturer BAe, British Aerospace, today BAE Systems. The US-produced variant is the AV-8B, British Harrier II are designated GR.5, GR.7, and GR.9. 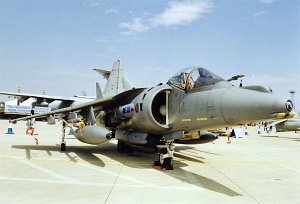 The Harrier II / AV-8B is a development of the BAe Harrier GR.3. Development was mainly done by McDonnell Douglas.